must have shown the signs of leadership ability in his nature from a young age. Such people are born to be leaders. This type of Headline is no doubt an invaluable indication of brilliant leadership but like any other sign in the hand good or bad, it needs to be confirmed by other signs. 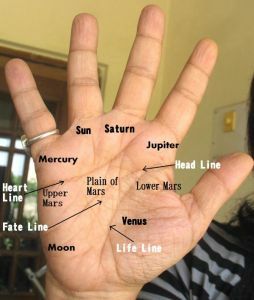 Such a line is of no use on a hand with chained lines or a short thumb because leadership needs to be backed up by a clear mind and a strong, determined and goal oriented personality which can actually connect with others. 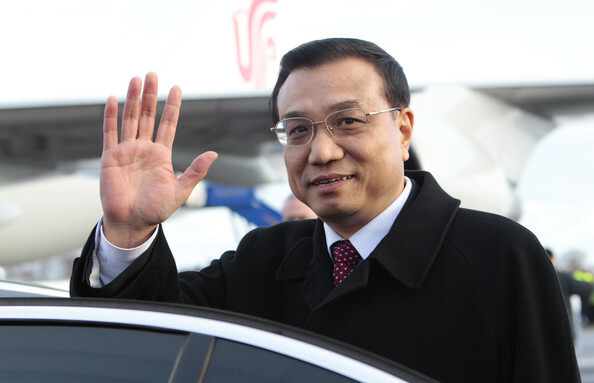 The shape of Li Keqiang’s hand is a good one. A large broad hand with fingers of medium length (neither too short nor too long), a good thumb and well-developed mounts. He has the warmth of personality to connect with others, and the aggression and mental strength to control and lead them. He is also a man with strong willpower, and will not budge from his position easily. He can be hard to convince as he has the self-confidence and strength to carry on in the face of opposition. He also has a straightforward an approach to solving problems, and is an original thinker. Honour and idealism are both a part of his personality. The drawbacks of his personality are that he tends to be short tempered and moody. Li Keqiang also appears to have two Headlines. Two Headlines are not a problem if they are both good, but in Li Keqiang’s case, the first Headline is not a balanced one. It is tightly bound to the Lifeline and then rises up to join the second Headline. As this sign is not visible on the left passive hand, it is very likely that there were some restrictive circumstances in Li Keqiang’s life, either financial or parental and it was only around the mid-twenties that he managed to get over it. Whatever these circumstances were, they were a dampener on his inherently brilliant personality. It was an inherent strength of character which made him rise above the circumstances and fulfil his potential. It is very likely that he carries some emotional baggage from his past and this could have an effect on decision-making. He has to be very careful that his decisions are based on rational thought, and not influenced by emotion. You might also like to read Wen Jiabao's hand analysis or The Dalai Lama's hand analysis or other hand readings on those from China or of Heads of State from around the world or all Politicians. The Chinese political system is very complex to understand! Wiki says that he is the no. 2 person in China - Well, that's something! It's not surprising that he has leadership qualities, but is there anyway to determine if people will abuse their power, later on? Yes it is possible, but one cannot get such a clear picture of his hand. With a clear print, this can be told to some extent. This reading can not be authenticated unless until supported by the prints of of the subject. Always give the hand prints of both hands. No hand photos are published here, as I do not own any photos. Those who publish photos which do not belong to them are doing something illegal. It is all about doing something ethical and legal. Just because I can get away with it does not mean I will do it. I do provide links to public photographs. That said, I do check both hands but do not usually provide a link to the passive hand. There is no need really because these images are found on the web fairly easily. However, from now on I will certainly consider providing the link to the passive hand if I find a decent photograph to link it to.